This article is a little two fold, the first being the above and below images showing the beginning of a six week advertising campaign in Hispanic Markets. 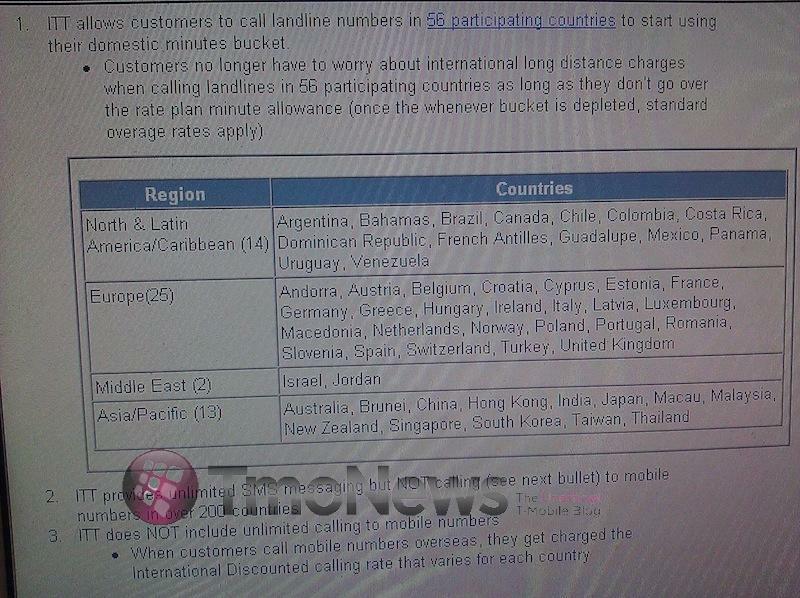 T-Mobile hopes to boost awareness for its International Talk & Text service by showing these markets you can call landline numbers in 56 countries using your domestic minutes bucket. We first learned about this back in November and with yesterdays investor call, emphasis was placed on creating future awareness for T-Mobile’s unique international calling plans. 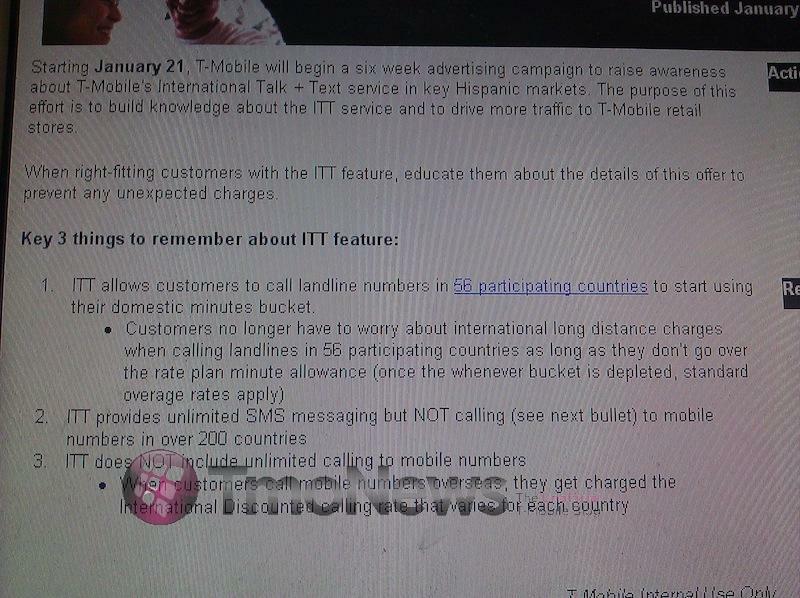 This brings us to the second point of the article and that is T-Mobile plans for future international offerings. We can’t be 100% sure on what exactly this will mean but T-Mobile CMO Cole Brodman stated that moving forward later this year Flat Rate data plans will be available for international data combined with flat rate voice and plans. Customers want fixed rates and T-Mobile wants to avoid bill shock from customers who arrive back in the United States to hundreds if not thousands of dollars worth of international charges. Therefore, it will also be introducing daily, weekly and monthly plans on a flat rate scale to offer the best value among the competition for international offerings. That is incredibly ambitious and while it’s likely they’ll ultimately find the competition matching with similar offers, it’s nice to see them taking the initiative. “it’s nice to see them taking the initiative.” indeed. Has any tried using wifi calling outside the US? Will I be charged international rates? If you are overseas, and are still using your Tmo phone, you can connect to a wifi network and call a domestic US number and not be charged international roaming charges. You may want to disable everything except wifi on your phone to make sure that wifi is your only connection available just to be 100% safe. Tmo does not care where the IP is originating from when you make wifi calls, just remember that is still will count against your minutes unless it is night/weekend time. um, why would you do that when cmedick just explained the way to make completely FREE calls? because wifi isn’t available everywhere. i have my phone unlocked and can now put in UK SIM when i next travel there. Last trip to London cost me hundreds extra on my bill and I literally limited myself to a few data syncs a day for 10 days when I wasn’t in wifi range. new plan sounds promising. can it be a domestic US cell number or does it have to be a landline? Also, is the night/weekend times based on when you’re making the call (in the foreign country) or is it based on the current time in the US? Thanks! Have you confirmed this? I was planning to use this in Germany in a few weeks. Well as it stands, it wouldn’t work overseas, just calling from the US to a landline overseas. I can confirm this does not cost extra. I was in Australia 2 weeks ago and it worked perfectly. As the other person said above make sure you disable everything but wifi. on blackberries you will not. i am not sure about android phones. WHERE’S PHILIPPINES? STUPID NOT TO INCLUDE IT ON THE LIST! tmobile stated that the list will be updated as time goes on. it is initially just these 60 or so countries. Wished they included international sms with there messaging package like they do with there simple mobile plans. *free unlimited international texting to the whole world, not just the ones in the pic. the countries in the pic are for calling. I know what it is, I’m just saying it would be nice to have the international sms included in the standard messaging package as T-Mobile does with simple mobile. The calling is not included but the sms is. wow T-mobile is thinking about what we need now , no wonder i’ve been with them for over 7 years. I think T-mobile is in a right spot to be more competetive with those Big 2, special T-mobile is a multi-International company which have a huge space to be more innovative to promote their services . I totally disagree, I think this is DT leveraging their international contacts. Sprint doesn’t even have service overseas, I don’t see them jumping on this boat. This IS/COULD BE HUGEEEE!!! I agree! Are they going to be completely new plans? Will this be included into the current plans, or will this be an add on service, say, an additional 1.99 a month type thing? A. Eliminate overage charges. The user gets a reminder on the phone display when they are close to using up talk minutes or data plan units. Make it so the user can choose the frequency and when the reminders appear on screen. Those are silly phrases but you get the idea. While other carriers are in unison going in the same direction, hiking up rates and basically charging more for less, T-Mobile can dramatically advertise going in the opposite direction by implementing consumer/user friendly policies and stabilizing current rates. As I said before, T-Mobile should get rid of overage charges (or at least give consumers multiple ADVANCE warnings that they run the risk of going over talk or data limits) and simply eliminate early termination fees. [Scene] Al “Scarface” Pacino lookalike is sitting at his desk in his mansion. Camera closes in. Al is holding a T-Mobile handset. [Scene] Scarface holds up a T-Mobile phone in one hand then stands up. He then grabs a pointer and starts talking in polished English. He then walks over to an easel that has easy-to-read charts that has on each page the great things T-Mobile is doing to become the consumer’s friend. people would take advantage of the no term fees in a sec, there are plenty of dishonest people out there but the rest of what your saying would be a great idea. Not sure why you posted it here and not sent that to corporate, im sure they would love that one. Ive noticed also theyve unblocked Tmonews on our CP’s lol grats David! I am in a professional industry. Very few of my colleagues are on T-Mobile. They pay AT&T and Verizon $250 for each account and don’t think twice about it. In fact, a lot are at firms where the office pays AT&T thousands each month for cell service for each executive. My gf’s NYC headquartered office pays about $500,000 monthly to AT&T for cells to its executives nationwide. When she made director they made a big deal out of giving her a BlackBerry. They have a hotline to some IT guy at AT&T who jumps when her IT people call. LOL. They don’t concern themselves with installing updates on the Vibrant or that data went up $5 monthly. What does your story has to do with this news my friend? no, but if they can do things more cost effectively they will jump out of their chairs rather than their IT guys lol. You sir are the people that Tmobile is eyeing above if the above statement about International Packages Holds true, I usually tell customers to get prepaid SIM cards for the exact reason you’re explaining to prevent bill shock, Its no longer a profitable area in the wireless industry especially when you can unlock and put a diff SIM card in your phone and give your business to another carrier and I think Tmo is finally starting to see that. T-Mobile has been sitting on a gold mine that they haven’t figured out how to take advantage of: They rely on DT for interconnectivity for data roaming traffic for years. There is certainly no additional cost for carrying a US traveler’s data traffic while roaming in (for example) Germany over T-Mobile’s network there. The best mobile experience should be about promoting the use of a mobile phone instead of forcing users to find alternatives to it, whether they are calling card companies using VoIP or Skype or Google Voice or free WiFi. All mobile companies including T-Mobile bring this upon themselves. They still think they own the only access path to communication highway for people on the go, since they own the radio spectrum. By their own greediness, they open up the world of communication to arbitrage hence Skype, Google Voice, Jajah, Fring, etc. I can understand their greediness if I happen to be traveling on a German autobahn, but in Frankfurt airport it doesn’t make sense. They better start thinking about elastic pricing based on locality. By the way this applies to home market as well. With my german T-Mobile sim Im able to use my minutes all over europe but sadly not in the USA on T-Mobile US which is stupid. Plus with T-Mobile and Vodafone in all those countrys the first 60 incoming minutes are free. I think this will be the way to go thats the point where Sprint cant compete also Verizon cant really compete since they dont allow Vodafone to buy the needed shares to take over control and so they are not part of the Vodafone network. haha if they do allow the type of roaming that is currently being done in Europe *check the UK website* then I suspect they will indeed rule the world in terms of the business sector. A shark like ATT Verizon cant compare with the Battleship that will become TMobile with big Brother DT. Would be hard to do that as each country has its own rules and regulations. I suspect Magenta will indeed stop the long standing tradition of Tmobile USA being left alone for the most part to do its own battles and bidding though…So in a way its uniqueness will begin to dissapear and will be one brand as a whole. The EU wants to cancel roaming fees within europe in 2012 so they will probably merge their networks. – Probably what T-Mobile is going to do. They will leave the HSPA network for Cellular data or Phone Service. Besides no Need for a Phone to have 1 GB LTE im sure 652 LTEH or whatever it’s being called will be more than a enough to handle the business needs of people for quite sometime, I wont be surprised to see them have no LTE caps if the cells arent clogging up the LTE network Probably the reason Verizon has the Iphone4 for the CDMA network is because they know it would cripple their supposedly fast LTE network. As you transition customers to LTE phones Iphone will be left behind and wont affect them as much. They already did merge in the UK. They ve built up this “everything everywhere” company which is controlling now the T-Mobile UK and Orange UK network but they are not one company yet they just share the network. Metro PCS has a USD $5 add on that offers unlimited calls to land lines in those countries. Tmo is not changing anything in the game. Metro PCS is the game changer; unfortunately, their reputation is so bad (People call itr “Metro piece of… “) but the service and coverage is getting better and their phones are not as good as Tmobile (also you have to pay full price). It’s good to know that Tmo is jumping in this new option launched 2 years ago by Metro. Youre wrong david they will not match T-Mobile’s power especially when they own the network they will be roaming on, that is ambitious and will drop kick ATT Verizon and Sprint right in the face, Finally DT is leveraging their International Muscles and showing ATT and Verizon who has the best coverage worldwide (LoL) its time to take those International Business People and bring them under the Magenta Wing as they are a highly profitable sector in the wireless business. Some strange people commenting here. That is great for business travelers. Finally. I fly to Europe all the time now with newer data eating phones this is a great idea. It is so expensive to roam. It used to be talk that was expensive now most phones rely on data so it costed a lot more. I like the idea you can pay add on for the time being outside the country and not be shocked. By the way ignorant Guest person clearly you think outside the US means Mexico. Open your horizon, learn , educate yourself and don’t be ignorant. Otherwise your life would be a WASTE in other human being’s world ! Hopefully DT is finally lifting up its bum and integrates T-Mobile US fully into the T-Mobile family so that subscribers from both sides of the ocean can use their minutes and ad ons via versa. Because thats the big leverage point to gain business customers. Yup, they are misleading people! One day I have 10gs the next day 5gs..and they don’t tell you they change it..you just use the data you’d been using and oops..yove gone over! LAME..IM LEAVING T-MOBILE! Just added this to my account, as NOW I definitely needed. So others know, since it’s not stated on the site, you use plan minutes only when calling at peak time. When calling at night and weekends you don’t take a hit on your whenever minutes. I called in to be sure about that.